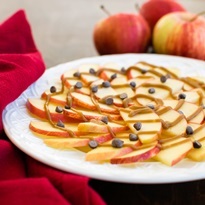 You can enjoy these apple slices topped with a 5-minute, wholesome caramel sauce as a nutritious treat or sweet snack. Arrange the apple slices on a plate, or just toss them on. In a small bowl, whisk together the seed butter, maple syrup, and vanilla until smooth. Drizzle or spread the seed butter caramel atop the apples. If it is too thick, warm it for 10 seconds in the microwave and whisk. Sprinkle on any optional toppings, if desired.